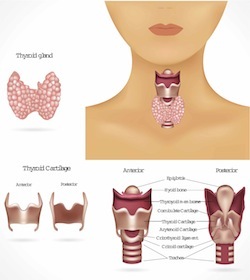 Gonadotropin, also known as FSH (follicle-stimulating hormone) and LH (luteinizing hormone), could be a cause of infertility in women with hyperthyroidism. Researchers from the Datta Meghe Institute of Medical Sciences and Acharya Vinoba Bhave Rural Hospital recently studied a group of 80 women all with either subclinical (46) or overt (34) hyperthyroidism. Patients in the study suffered oligomenorrhea and menorrhagia with 47% of the woman experiencing a normal menstrual cycle. After a radio immunoassay, FSH and LH were noted lower than normal levels in both groups. The lowest values were measured between days two and five. Conclusion: If patients with hyperthyroidism are suffering infertility, doctors should look at autoantibodies as a possible cause or contributing factor. Source: Acharya N, Acharya S, Shukla S, Inamdar SA, Khatri M, Mahajan SN. Gonadotropin levels in hypothyroid women of reproductive age group. J Obstet Gynaecol India. 2011 Oct;61(5):550-3. Epub 2011 Oct 26.